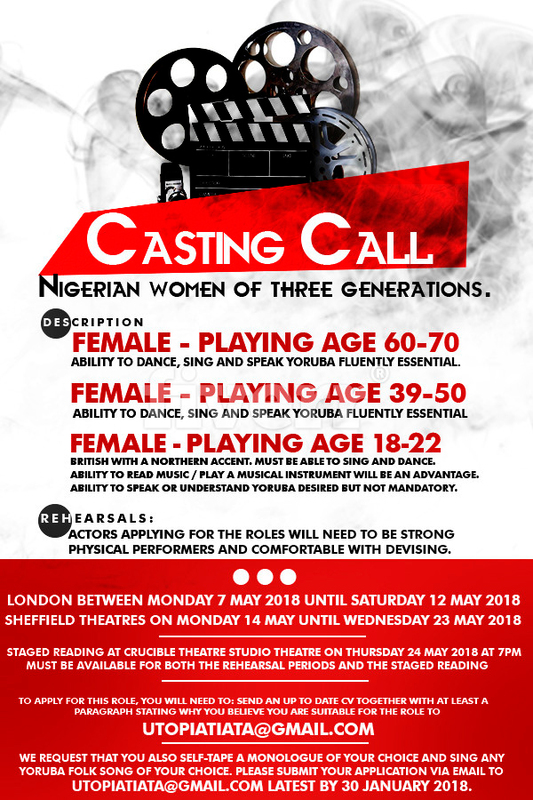 We are looking for three female actors to be a part of our work in progress workshop of Shadows in Different Shades. Following the workshop, we will share a staged reading for industry people and the public. Actors applying for the roles will need to be strong physical performers and comfortable with devising. Rehearsals will take place in London between Monday 7 May 2018 until Saturday 12 May 2018 (usual hours 9.00am - 5.00pm) and in Sheffield Theatres on Monday 14 May until Wednesday 23 May 2018 (usual hours 9.00am - 5.00pm). Staged reading at Crucible Theatre Studio Theatre, Sheffield S1 1DA​ on Thursday 24 May 2018​ at 7pm Must be available for both the rehearsal periods and the staged reading. During rehearsals, the rate of pay is £500 for a five-day week. During the time in Sheffield, the Company can assist with finding and paying towards local accommodation. Travel to Sheffield will be provided. Utopia Theatre is an Equal Opportunities employer who welcomes applications from all sections of the community. Application and audition process To apply for this role, you will need to: Send an up to date CV together with at least a paragraph stating why you believe you are suitable for the role to utopiatiata@gmail.com. We request that you also Self-tape a monologue of your choice and sing any song of your choice. Please submit your application via email to utopiatiata@gmail.com latest by 28 February 2018. We may contact you to arrange a follow up meeting in person. If you have any questions, please feel free to contact Moji on 07584 243464.
Who is Utopia Theatre Company? “Our Stories Connect Us” Utopia Theatre is a Sheffield based professional theatre company led by Artistic Director, Moji Kareem. We create old and new plays and re-imagine classics in a way that demonstrate their contemporary relevance and appeal to a new audience and regular theatregoers. We are committed to producing excellent theatrical experiences that tell the stories of the African Diaspora. The company synthesises African and Western performing traditions to celebrate the meeting of different cultures and present productions in Yorkshire, London and on tour, with programmes aimed at developing and promoting Black writers and performers. We are also a resident company at Sheffield Theatres. 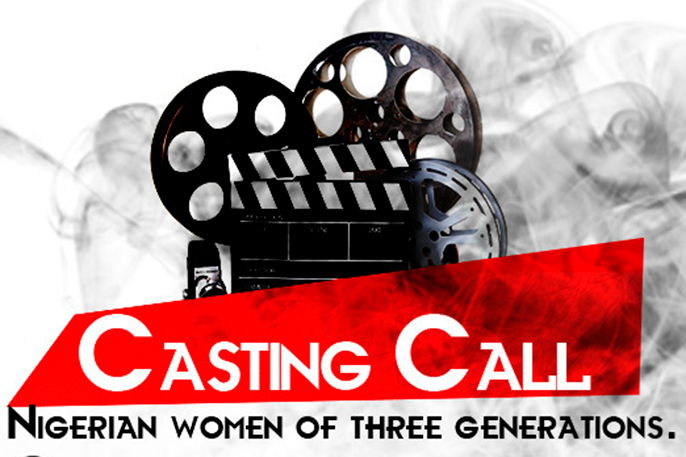 We are looking for Nigerian women of three generations. A softly spoken, traditional, culturally astute, educated and proud Yoruba woman. A strong singer. Ability to dance, sing and speak Yoruba fluently essential. A culturally astute, well-educated and proud Yoruba woman. A strong singer. Ability to dance, sing and speak Yoruba fluently essential. Ambitious and highly driven. Physically and emotionally challenging role. A vibrant, fashionable, physically fit, British Black woman with a northern accent. She is smart, cool and confident but reserved, almost to the point of snobbishness. Must be able to sing and dance. Ability to read music / play a musical instrument will be an advantage. Ability to speak or understand Yoruba desired but not mandatory. ‘Shadows in Different Shades’ is supported using public funding by Arts Council England. Shadows in Different Shades is a new play by writer Oladipo Agboluaje, developed in partnership with Utopia Theatre Company. Based on Moji Kareem’s life and that of her mother and daughter, the piece deals with what it is to be a daughter and a mother; a story of migration and shifting identity. 'Shadow in Different Shades' is a compelling and thought-provoking tale of dreams and broken promises, of hope, optimism and resilience in the face of harrowing circumstances. The play will address a whole range of issues including love, loss, struggle with self and the relationship between religion and mental health, position of women in society, religious freedom, miscarriage and female genital mutilation. Nigerian music will play a vital role in the piece.